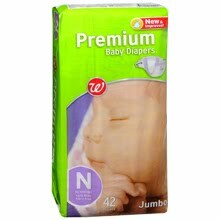 Walgreens Diapers $1.99 after Coupon & Rebate! Get ready to stock up on diapers this week for your babies and toddlers! Walgreens has an amazing deal that is hard to pass up! First you will need get an infant care coupon book (free at Walgreens). They are usually located near the pharmacy or sometimes at the front end of the store in some locations. Ask an associate if you cannot find them. They are free Walgreens coupon booklets filled with infant products/items. = $1.99 per pack after coupon and rebate!